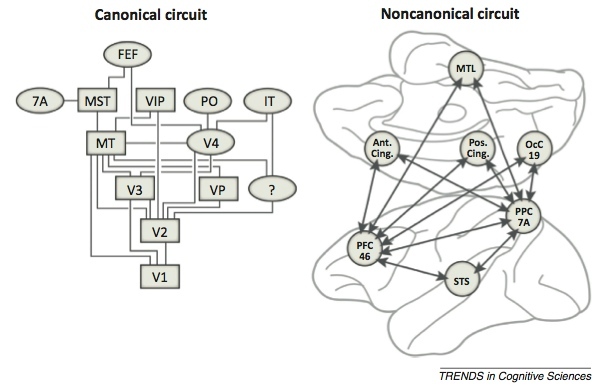 Joaquin Fuster (2007) summarized his theories on cortical organization with this diagram with a holistic view of cerebral connectivity. One of the important questions we have is how do primary sensory and motor areas inter-relate with association (multi-modal) cortical areas. This is especially critical for understanding human evolution, as recent work by Matthew Glasser and David Van Essen at Washington University in St. Louis shows strong evidence for the expansion of association cortices in ape and human evolution. So Fuster created a hierarchical schema (fig. 1): where primary areas, higher-order unimodal areas, and multimodal association areas exist in a hierarchical ladder. Higher order association areas, for Fuster, are broadly either motor or perceptual, depending on whether they are anterior or posterior the central sulcus. Fuster sees the top of the multimodal sensory hierarchy communicating to the top of the multimodal motor hierarchy, which then feeds forward to unimodal and eventually primary motor areas. Up the ladder, and then down. Recently, Buckner & Krienan (2013) have re-examined the question of cortical organization, with a special focus on association cortices. From their viewpoint, a distributed network-type structure makes more sense than a strictly hierarchical system. The groundwork for this hypothesis had already been laid down by Goldman-Rakic (fig. 2; 1988), who identified parallel connectivity across multiple association areas in macaques. Buckner and Krienan more or less merge Goldman-Rakic’s organizational schema with the recent revelations about association cortex expansion in hominids (fig. 3). They call their framework the “tethering hypothesis”, in which over time, cortical expansion changed mammalian brains from small, tightly knit and hierarchical structures to expanded parallel networks of large association areas “tethered” to one another. Whereas Fuster’s framework attempts to provide a holistic understanding of cortical connectivity, Buckner and Krienan are less concerned with primary-association networks and more concerned with association-association networks. 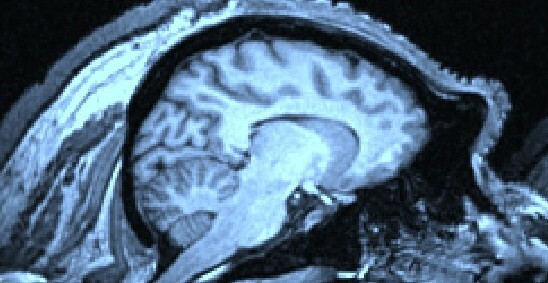 Given the recent proliferation of whole-brain network analyses in DTI and fcMRI, it’s not surprising that the current focus is on the portions of cortex which are referred to as “hubs” – and tend to be in association areas like posterior cingulate, posterior parietal, anterior cingulate, and middle temporal lobe. 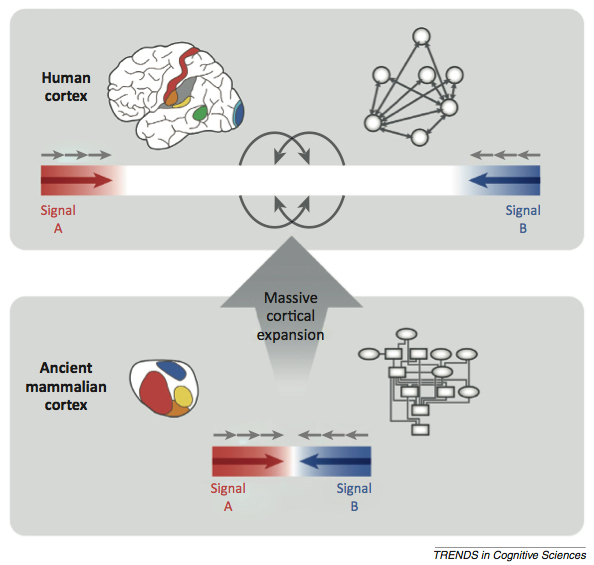 It will be interesting to see, going forward, how network theory can continue to inform our understanding of the consequences of the expansion of the cortical mantle in the primate lineage on the organization of our cortical connectivity. As Buckner and Krienan discuss, early data suggest that certain disorders associated with developmental trajectories, such as autism and schizophrenia, may be related to unusual whole-brain network connectivity. Ideally, to test this hypothesis, we’ll need whole-brain networks (functional and structural) in multiple primate lineages in order to determine what exactly is unique about the organization of human association cortex – and also to understand how expanding brains place different demands on connectivity. Presumably, other mammalian taxa who have convergently evolved large brains (elephants, dolphins and other cetaceans) may have similar new developments in their brain organization – or they may have unique connectivity solutions to the same problem (cortical expansion). Unfortunately, for now, there is little to know connectivity data, let alone whole-brain connectivity data, for other large-brained mammals. Comparative neuroanatomical research is traditionally poorly funded, but perhaps with the additional funding from Obama’s brain initiative, the National Science Foundation will prioritize this type of research initiative. This entry was posted in Cortex, Evolutionary neuroscience, Human evolution, Networks and tagged association, Buckner, cognition, connectivity, cortex, evolution, Fuster, Goldman-Rakic, Krienen, mammals, National Science Foundation, networks, primates. Bookmark the permalink.